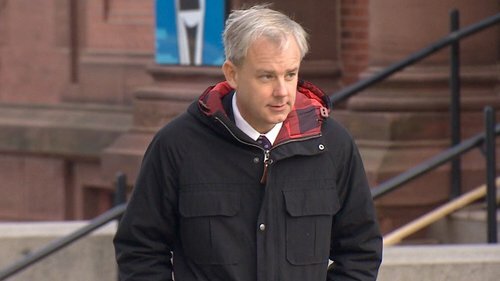 The murder retrial of Dennis Oland in the 2011 death of his multimillionaire father Richard Oland resumes today with ongoing testimony of the head of the Saint John Police Force's forensics unit. Oland trial day #7 . Still in the witness box today is Saint John police forensic specialist Sgt. Mark Smith. Day 7 of the Dennis #Oland murder retrial is about to begin in #SaintJohn #NB . Oland wears hearing aids. The headsets amplify the proceedings. Problem with the system seems to have corrected itself though. Smith takes the stand. In a preliminary matter Crown prosecutor Jill Knee tells the court the trial is one day behind schedule and asks for an additional day to be added to scheduled sittings in January. Veniot asks if Smith ever saw officers in the bloody crime scene where Richard Oland's body was located on July 7, 2011. Yes. Insp. Glen McCloskey and Const. Greg Oram. Sgt Smith begins recalling a second time he ran into Inspector McCloskey inside the crime scene - this time with Cst Greg Oram. Smith said he was unhappy. "Did you authorize them to go in?" asks Venoit. "No I did not," says Smith. What did you do? "I sternly ordered them to get out of my crime scene." What was their reaction? They walked out of the crime scene. “I sternly ordered them to get out of my crime scene,” says Smith who had stepped out briefly to retrieve more items from his police van. Smith is leaving no doubt he found the intrusions unprofessional and a threat to the integrity of the evidence laced scene. During the first trip in, McCloskey and the other senior officers were under Smith's supervision. He instructed them where they could walk and how far they could go. 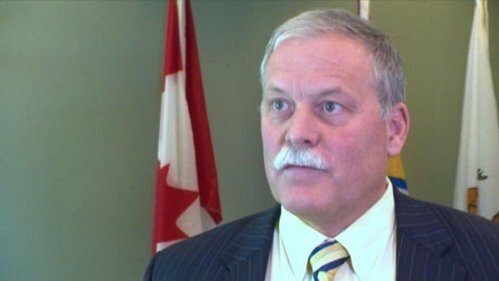 When McCloskey testified at Oland's first trial in 2015, he said he went farther into the crime scene the 2nd time than previously directed by Smith. McCloskey said he went back into the crime scene out of "curiosity." "It was wrong, I shouldn't have been in there," he testified, adding he was embarrassed. Smith says all of the computer monitors were either in sleep mode or off when he arrived, around 10:06 a.m.
Internet is spotty inside court this morning slowing down posting but truthfully not a lot of interest happening. 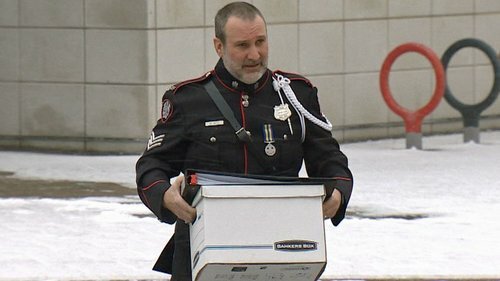 Smith is methodically being led through photos of office computer and electronic gear inside Oland’s office that was marked and eventually removed for analysis. Court heard yesterday he was the only forensic officer available that day. Crown is finished asking Smith questions about this part of his involvement in the case - the first three days. He will return later in the trial to testify on his involvement in other matters. Defence lawyers will not cross examine until after those later appearances. Crown prosecutor P.J. Veniot asks Smith if that's part of his vernacular. "Apparently it is, I didn't realize, I apologize," says Smith. "It's an inconclusive way of speaking," judge remarks. Veniot asks Smith, who's from P.E.I., if that phrase is used there. "A lot of phrases," he replies, prompting a few chuckles. When you say, 'I would have,' what do you mean? asks Veniot for clarity. "That I did." Veniot is finished asking Smith questions for now. He's "stood down" to return to testify at a later date. Defence lawyer Michael Lacy opts to save his cross-examination until all direct examination of Smith is completed. Court is on morning recess. Oland trial is back in session. Crown prosecutor P.J. Veniot calls Const. Rob Carlisle to the stand. Next witness is Saint John police Cst. Rob Carlisle who was asked to collect all security camera video he could find along King Street for the time preceding the murder. Carlisle went up and down the street asking businesses if they had cameras pointing toward the street. Carlisle said inside cameras were common but outside cameras were rare. Carlisle then started canvassing businesses on the north side of King St, such as Business Development Bank of Canada, Bayview Credit Union, Pictures Plus etc. Many businesses had surveillance inside, but not outside, says Carlisle. Carlisle obtains some video from City Hall and Subway and makes arrangements to obtain video from Tim Horton’s on the following day. Anyone driving to Oland’s office which is on a one way street would most likely have to turn in from King Street. Lacy asking what instructions Carlisle was given in searching for video. Carlisle said he was told to look for someone 5 foot 10 inches wearing beige pants and a dark jacket.